CARROLL GARDENS — Since it's such a rare opportunity to find a carriage house on the market, Open House Insider felt compelled to drop by this weekend's showing at 246 Union St. on the border of Cobble Hill and Carroll Gardens. Listed by Halstead, the three-bedroom, one-and-a-half bath property sits on a tree-lined block lined with brownstones and carriage stables for larger homes. Upon entering Sunday's open house, we were treated to a view of the former stable, now serving as a roomy garage space, which we were informed, is rented out for a "healthy" price — and could potentially offset the home's even healthier price tag. Inside the well-lit living room, it was clear that prospective buyers were not in attendance, but several Halstead employees were on-site, some sitting at the kitchen table and another in the bucolic side garden, hard at work on her cell phone. 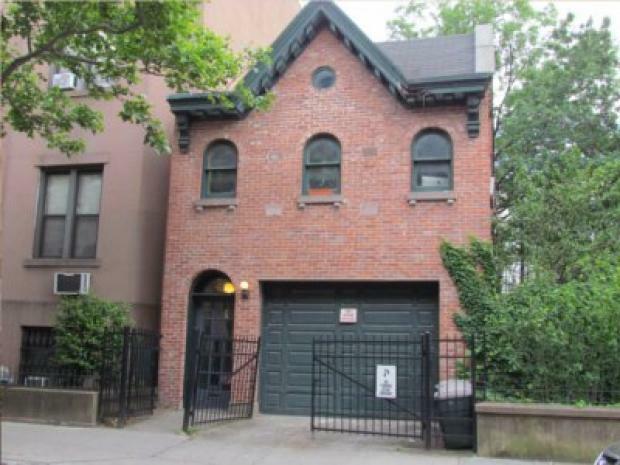 "This is a rare find," Halstead broker Andrew Freidman said about the well-maintained, South Brooklyn carriage house. Also at work was one of the home's current tenants, upstairs in the street-facing bedroom where she sat a desk "editing a film." No one was evident in the master bedroom that faces out onto the back of the building, nor was anyone behind the closed door of the middle bedroom. What was evident were copious amounts of original details throughout the home, like the old stencil at the top of the stairwell hinting to a time when the carriage house was used in a more commercial capacity. "This place is full of cool stuff like that," Friedman said. The Insider's mind was sent spinning with possibilities should the current "hippie-ish" decor be replaced with something more befitting of the space, its locale and its history. Time will tell if the "worker commune" feel at 246 Union St. can be made to feel more "Brownstone luxe," and if it will take the full asking of $2.3 million to get the privilege to try.